There are two different methods that you can choose from when deciding on a concrete fence. One is to purchase precast concrete blocks, and the other is to get precast panels. The other method is to get precast concrete panels. The panels for this fence are constructed offsite and then brought in and hung or placed into the fence. This type of construction does require that a professional concrete fencing company do the installation, as a number of very special pieces of machinery are required to place the concrete sections into their proper positions. The concrete panels are far more stable than any other kind of traditional wood fence, or concrete block fence. The other big advantage of using precast fence panels is that the sections can be as long as fifteen feet. The longer the span of section used, the fewer support posts required. Furthermore, the number of sections that will be needed to make the enclosure will also be reduced. Concrete fencing is very decorative. There are many designs and models to choose from. Precast concrete can be formed to resemble brick, natural blocks or can be custom deigned to your specifications. The new method of forming precast panels is to use an up-right mold. This technology enables the manufacturer to produce a double sided wall in one casting. Concrete panels are available in a number of standard heights. The normal heights are three, six, eight, ten and twelve feet. The three or six foot fence sections may be perfect to use as garden fencing or a perimeter fence for your yard. However, if security is your main concern, you should probably invest in a fence that is at least eight feet in height. 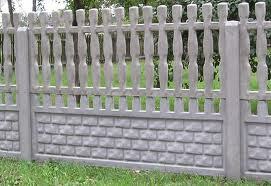 Concrete fence panels are being used more and more for both residential and commercial properties. The new molding technologies and better installation processes are reducing the costs of creating and constructing solid, dependable walls. 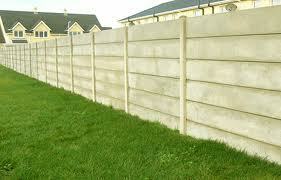 If you want to have complete privacy and security, there is no better value than a concrete fence. Solid concrete fences are a brilliant cost effective way of ensuring that security is of paramount importance. Would I need planning permission to change an outside 6′ wooden fence to a concrete 8′ one? My garden backs on to a main road. It would be prudent to call your City Hall to ask them. Depending on your city by-laws and other factors like higher fence walls blocking traffic views (if your home is located on a corner lot), the city authorities will guide you appropriately. In fact, if I were you, I would make sure to consult them before making such a change. Concrete is an excellent material for fencing. I’ve been loving the look of coloured concrete fences latley. It may become my own spring garden project.